“The Open Doors Citywide Festival is an exciting opportunity for all of us to not just showcase art in our city, but also to show the rest of the country how to advance community by using art,” said Mayor Baraka. 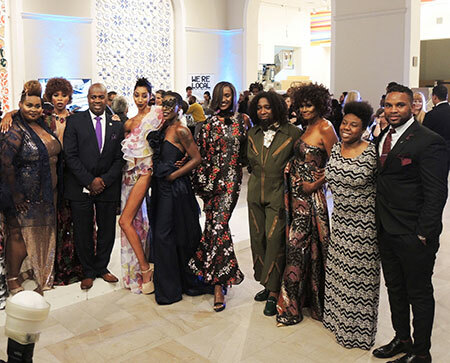 A fashion show at the reception highlighted designs that inspired the contribution from Mr. Hall and the Berkeley College students to the Open Doors Citywide Festival, a signature celebration hosted by the non-profit organization Newark Arts. Titled “Asian Minor,” the exhibit displays an eclectic mix of pattern, prints and colors that embodies the culture and essence of Turkey, Tibet and Mongolia. While the Fashion Club is comprised of students from all majors, many members are enrolled in the Berkeley College Fashion Merchandising and Management program, which integrates the creative and business aspects of the fashion industry with current technologies, covering the complete fashion global supply chain. “Asian Minor” is part of an array of exhibits, screenings, workshops, artist talks, performances, and open studios that are occurring throughout the City of Newark as part of the Open Doors Citywide Festival. Mr. Hall and students’ collaboration will be on display from now until October 15 at the Berkeley College campus in Newark (536 Broad Street). Click here to view a full listing of events open to the public taking place during the Open Doors Citywide Festival (from October 12 to October 15). “We are totally committed to involving Newark’s next generation in arts and culture events like this festival, and are glad to have Berkeley College and its talented students as partners,” said Lauren Craig, Marketing Manager, Newark Arts. “Being a part of an initiative that presents Newark as an arts hub for New Jersey and beyond provides our students access to the arts and resources that will enhance their higher educational experience and prepare them for success in dynamic careers,” said Earl Brown, Campus Operating Officer, Berkeley College, Newark. Mr. Brown also lauded Anthony Clark, Business Developer with the Office of Career Services at Berkeley College, for his role in facilitating the collaboration between Newark Arts and Berkeley College. Photo Captions: (Top) Ras J. Baraka, Mayor of Newark, NJ (third from left), welcomes the Newark community to the opening reception of the annual Open Doors Citywide Festival, held at the Newark Museum on October 11, 2017. Also picture with the Mayor is Marco Hall, Newark-based fashion designer (fourth from right); Camille Brown of East Orange, NJ, President of the Berkeley College Fashion Club in Newark (second from right); Earl Brown, Campus Operating Officer, Berkeley College, Newark; and models who appeared in a fashion show organized by Mr. Hall and students from the Berkeley College Fashion Club. 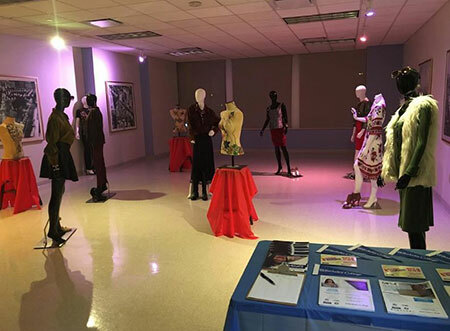 (Above) “Asian Minor,” an exhibit featuring designs stylized by Marco Hall and students from the Berkeley College Fashion Club in Newark, is on display until October 15 at the Berkeley College campus in Newark, 536 Broad Street, as part of the Open Doors Citywide Festival. A leader in providing career-focused education since 1931, Berkeley College is accredited by the Middle States Commission on Higher Education and enrolls more than 7,100 students – including more than 440 international students – in its Master’s, Bachelor’s and Associate’s degree and Certificate programs. Students can study in more than 20 career fields. Berkeley College is comprised of the Larry L. Luing School of Business®, the School of Professional Studies, the School of Health Studies, and the School of Liberal Arts. The School of Graduate Studies offers an MBA in Management online and in Woodland Park, NJ. Berkeley College has five New Jersey campuses – Dover, Newark, Paramus, Woodbridge and Woodland Park. In New York there are three campuses – Midtown Manhattan, Brooklyn and White Plains. Berkeley College Online® serves a global population. The website address is www.BerkeleyCollege.edu. Newark Arts’ mission is to power the arts to transform the lives of those who work, live and play in the great city of Newark, NJ. Established in 1981, Newark Arts advances and expands the resources and offerings of arts and cultural organizations in the great city of Newark. Newark Arts provides leadership, direction, and technical assistance through partnerships with artists, arts administrators, community organizations, community development corporations, planning groups, economic development agencies, and government agencies as well as the general public. For more information, visit www.newarkarts.org.